We offer food in the town of comedy and "kuidaore", Namba in Osaka. Here you can find traditional cuisine of Japan, tempura, sushi, Osaka's famous takoyaki, okonomiyaki and kushi-katsu, etc. Through the expertise of our staff you will make great memories from your trip to Japan. 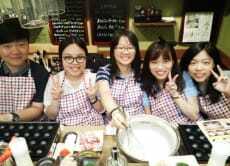 Why don't you try Japanese cooking experience with us?